Free wi-fi at the Gallery: the visit is now richer! 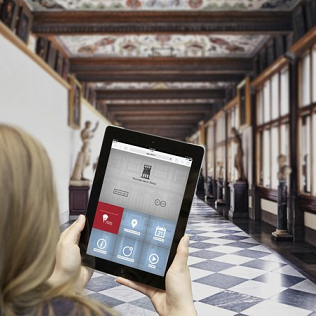 Since yesterday, July 7th, the two floors of the Uffizi Gallery – for a total of 13 thousands square meters – have been covered by the wi-fi network which will connect for free up to 500 visitors at the same time. A museum with over 400 years of history must be able to keep pace with the contemporary: this is the concept expressed by the director of the Uffizi Antonio Natali, during the presentation of the network. Thanks to the association “Friends of the Uffizi”, which has funded work which lasted approximately eight months, this gap has been filled and the Florentine museum keeps pace with the big galleries worldwide. Now visitors – through their smartphone or tablet – can connect to the Internet to search for information on the works they will admire in the museum. In particular they will find information on a website dedicated to the Gallery, currently available in Italian and English. In the future, the network will be used for other projects of the museum, such as augmented reality applications, 3D reconstructions, virtual reality, video in high resolution. So, a visit to the Uffizi is now even richer, thanks to the use of modern communication devices: visitors will be able to enjoy many more details, but also of different types, as they are made according to these new tools.